Construction crews are busy making progress at the garage this summer. Recent work includes continued resurfacing of the parking stalls, interior and exterior painting, and demolition and construction of the stair and elevator towers and ground floor retail spaces. Thank you, garage users, for your patience as we resurface the parking stalls. 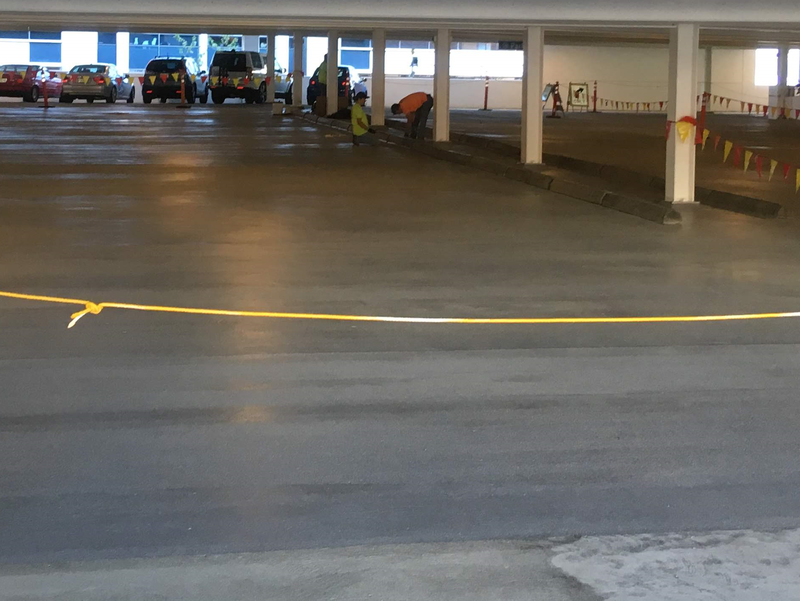 Crews began the process of pressure washing, coating, painting and striping the parking surfaces throughout the garage in June. Crews are staggering the work and will typically have two floors closed at a time throughout the summer. Please follow the signs and flaggers in the garage around closed areas. Thanks for your patience during this temporary parking disruption. A sign at the garage entrance lets garage users know the current status of the partial parking closures. Neighbors and garage users may periodically hear noise from pressure washing and an odor from the traffic coating when it is applied. Demolition of the stair and elevators towers at the southwest and northeast corners of the building is finished, and crews are preparing to pour the foundations for upgraded and modernized elevator and stair structures. The existing stairs and elevators on the southeast and northwest corners of the building will remain open until the new towers are operational. Structural steel for the renovation is being fabricated off-site and will be delivered in coming weeks. We'll send another update to let you know when SW 9th Avenue will be closed as crews use a crane to receive and place the structural steel.